There is no arguing that horses and humans have a special bond. Those who love horses have a deep-seated relationship with them, a relationship that can be so intense that some may call it irrational. There is a reason for this love. As author Cheryl Reed-Dudley illustrates in Horses that Save Lives, our interactions with horses can genuinely be transformative, even life-saving experiences. There are many ways that horses can save our lives. In a very literal sense, horses have been known to protect their riders from harm. In several stories shared in this book, when a human was in trouble, a horse stood over the person to protect them from being trampled or attacked. “Doc, Smokey, or Babe” expresses the truism that horses generally can find their way back to their barn, and take their riders with them. When lost in a storm, Ray Armstrong dismounts, holds onto his horse’s tail, and allows the horse to lead him to safety. While the stories in which horses protect or save humans are moving, it is the stories about the ways in which horses enrich our emotional and spiritual lives that are most inspirational, the gems in this book. Ryan Towne was in a horrific car accident when he was in his twenties. He was not wearing a seatbelt and was thrown from the vehicle. He suffered a brain injury and is wheelchair bound. Ryan writes about his experience with therapeutic riding and a thoroughbred named Carnival King. He shares the ways in which his therapy horse subtly encouraged him to push his limits. His father wrote, “None of us knew the depth of Ryan’s feelings when riding until he told his story.” Ryan’s tale describes one of the situations in which horses can bring out our persistence and courage. Ann Edie, after losing her guide dog, got a seeing-eye horse. Miniature horses have many advantages over dogs for guide work, not the least of which is that miniature horses often live more than 30 years while guide dogs generally provide fewer than ten years of service. This longer lifespan means that an individual will probably need only one or two horses in their life, and can develop a bond lasting for decades. Dave Morgan writes, “I can have the worst day of my life, walk out and talk to my horses, and everything is suddenly okay.” He makes known what many of the storytellers experienced, diminished symptoms of mental illness when they are with horses. From war veterans with post-traumatic stress disorder to individuals with depression or anxiety, engaging with horses can improve our spiritual and emotional states and help stabilize some mental health concerns. Not all the stories have charmed endings. Liz Kinkaid’s “Freckles and Tom” ends with her son never wanting to get on a horse again. Kinkaid doesn’t mind that, because her son lived when he might have been killed. A frightened horse’s choice to be level headed when it might have given in to fear is a blessing a terrified parent can count as an experience of grace. This book can be criticized for being syrupy sweet. That’s alright. The people who share their stories are so grateful for their relationships with their horses that they gush. If the stories weren’t a little bit cheesy, they wouldn’t be genuine. It’s the way horse folks talk about the horses they most love. Those who love horses will get it. Those who do not will roll their eyes and snicker at the over-sentimentality of the short stories. 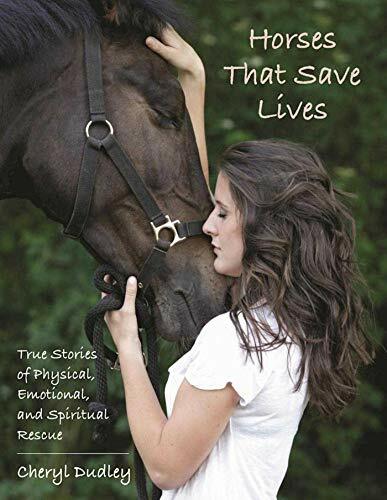 Horses that Save Lives: True Stories of Physical, Emotional, and Spiritual Rescue is a book that would make a great gift for the horse-lover in your life. They’ll pour through the narratives quickly, smiling at each, because those of us who love horses will relate to the stories. Horse enthusiasts regularly experience the ways in which horses uplift and save us, giving meaning and peace in an otherwise topsy-turvy world.